It's been months I have not posted any recipe for sweets. This time when I went to Kolkata, my mother regaled me with this lovely treat - Pao Madhuri. It's very easy to make, takes less time for preparation and makes an awesome dessert. If like me, you too are in the habit of sweetening your mouth with something sweet after a sumptuous heavy meal, this serves as ideal for that occasion. 'Pao' means bread and 'madhuri' in Bengali means "madhu" or 'something sweet'. Together combined they make this tempting delight - "Pao Madhuri". Please don't forget to leave comments if you like it. 1) In a mixing bowl, place the breads and pour the milk on top of them. Let the breads soak the milk for few minutes. 2) Meanwhile, in another bowl, toss together all-purpose flour, semolina, baking powder and cardamom powder. Add 2 tsp of sugar. Combine well. 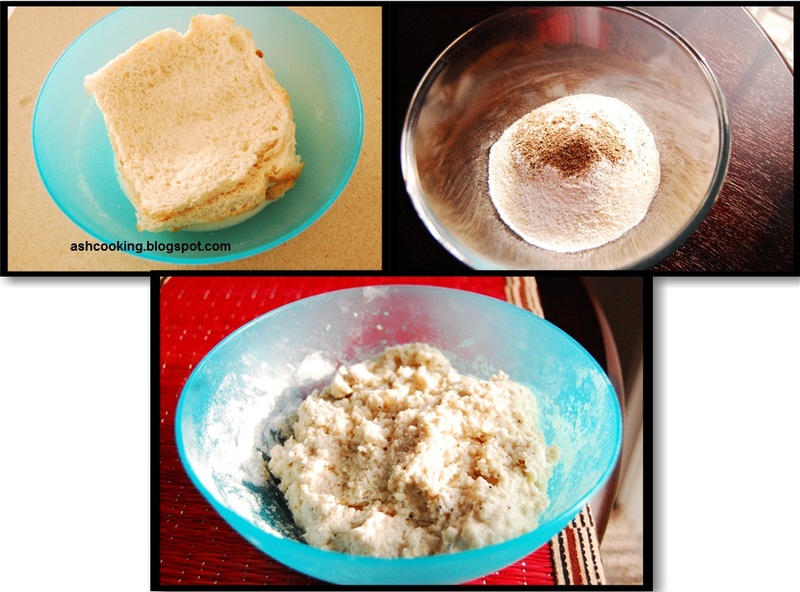 3) Now mash the breads and pour the flour-semolina mixture to the breads. Mix in properly. The batter would be gooey in texture. 4) Heat oil and ghee together. 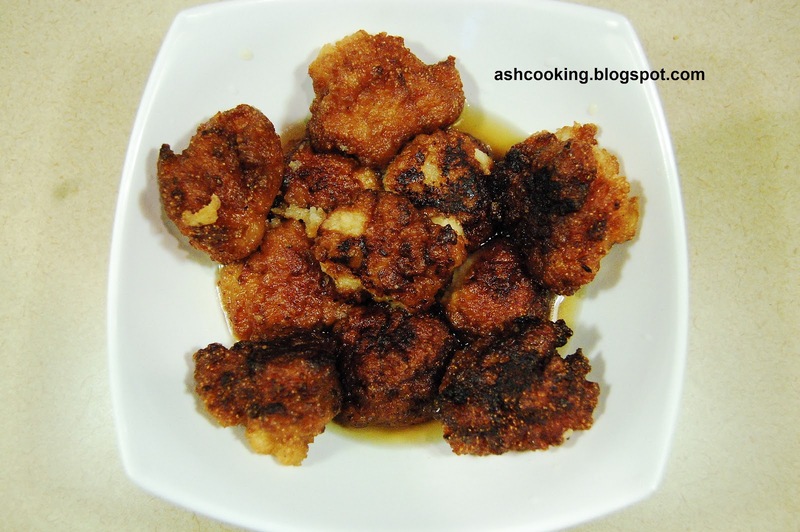 When oil becomes smoking hot, add spoonful of batter into the oil and fry till the balls turn golden brown in color. 5) Prepare sugar syrup of one string consistency. Soak the balls in the syrup. 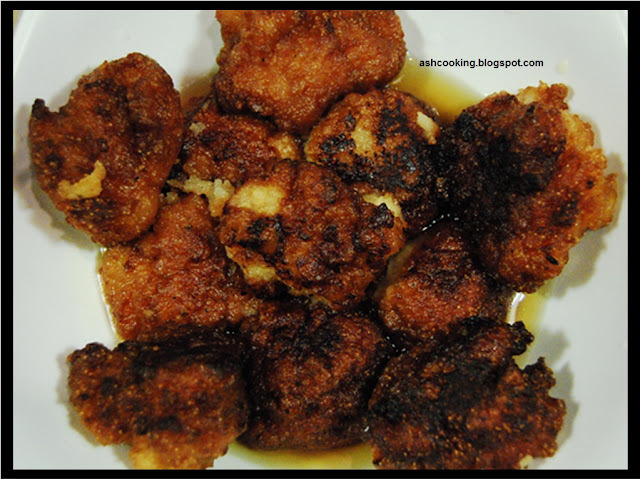 6) Serve pao madhuris when they turn soft sopping up the syrup at room temperature.